Hello again. CEO Olivia here. Today lets discuss alternatives to tethering. I’m not saying these are all ideal, but they are all better than tethering. I’d also like to say that you should never leave your good dog alone outside for extended periods & while your good dog is outside, it must always have access to fresh water & protection from the elements. The first & most obvious alternative to tethering is fencing. A proper fence can keep your good dog in while keeping unwelcome guests out. It should be high enough that your dog can’t jump over. Adding chicken wire along the base, but underground, can deter a digging dog from escaping. Now sometimes a fence isn’t possible, so the next alternative could be a large outdoor kennel or dog run. They come in all shapes & sizes & are portable. Again, this isn’t for extended periods of solitude. 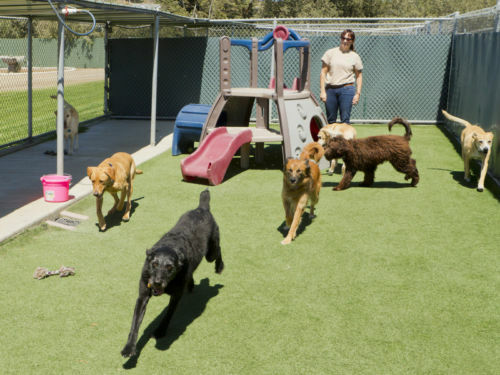 But if you have a small yard & can’t have a fence, a kennel may provide a safe play area. Finally, consider a Dog Daycare if you’re a human who works long hours. A daycare provides both safety & security as well as plenty of exercise & socialization. Do your due diligence & chose a daycare that has good feedback & meets you & your good dog’s needs. Do you know of other alternatives to tethering? If so, I’d be interested to know about it. On Friday, I will be sharing a feel good story with you. See you then.